Have you ever thought about going back to your childhood ? We propose a novel wearable suit that virtually realizes a child's embodiment and experience while preserving the user's interactions and perceptions. Virtualized child's embodiment through our own body will provide opportunities to feel and understand a child's perception and recognition, to encounter inspirations in daily life and to evaluate products and spaces such as hospitals, public facilities and homes from the aspect of universal design. 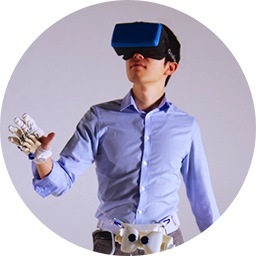 The suit consists of a visual line translator and passive hand exoskeletons. 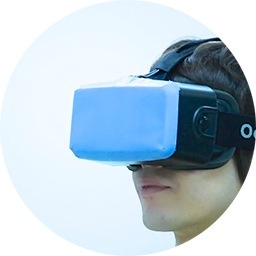 The visual translator simulates a child's POV(point of view) by using a pan-tilt stereo camera attached at the waist position and a HMD(Head-Mounted Display). The pan-tilt mechanism follows the user's head behavior. 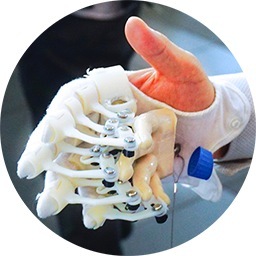 The passive hand exoskeletons simulate a child's tiny grasping motion by using multiple quadric crank mechanisms and a child-size rubber hand.